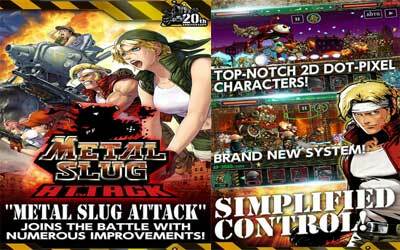 This is old version METAL SLUG ATTACK 1.9.0 apk for Android, you can install it if you want to downgrade or install old app. It is top Strategy apps from SNK PLAYMORE. It might not be in 3D; however the performance is even better than any 3D games. There are some type of game that you can enjoy includes combat school, P.O.W rescue, and also treasure hunts. Each of them has a plenty of fun. It is more interesting than the old game version that you commonly remember. You can improve the weapon and also the specs of player by collect the points. You can even have the great feature by collecting the items that are available. The more you have changes, the more powerful you are. These types of shooting game also offer you worldwide battles. By choosing real time battle, you will be able to enjoy the game with 4 players simultaneously. You can even cooperate with your brother in arms through its co-op missions. You can enjoy metal slug attack for android with your partners appropriately.